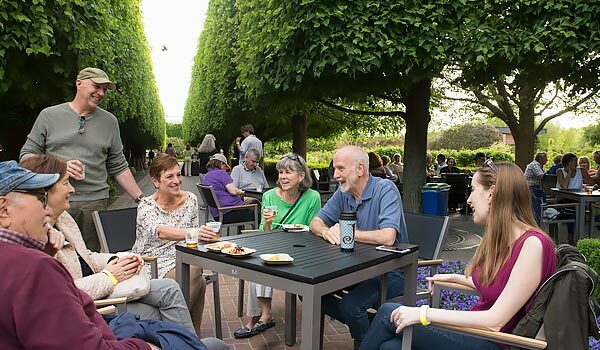 The new Rose Terrace Beer Garden (formerly the Rose Terrace Café) is a perfect place to relax and sip a beer or glass of wine and have a light bite. Craft beers from Wisconsin, Michigan, and Illinois breweries are featured at the beer garden. Four to six beers are available on tap, along with a dozen varieties in cans or bottles. The menu includes freshly prepared snacks, appetizers, sandwiches, and salads. Ice cream is available in the Garden View Café. Join us for Music at the Beer Garden from 4–7 p.m. on select Fridays each month.